JOHN EDMONDS has been dealing with the dark side of the UFO big picture, going down the rabbit hole for 19 years. A few months ago I visited his ranch and did an interview there (see below for the link). John and his wife (a former FBI agent) have been fighting with Grey aliens for many years. There are several vortexes on his ranch where beings of all kinds come and go. Some are friendly and some are not. Join us for an update on what’s happening lately out at the ranch. 1. Ascension Code book written explaining the first installment of the ranch events. 2. ET reunion due to the fist interview. We were able to reconnect. 3. Story of the actual reunion and why it took nearly five years. 4. Christopher Macklin ministry and energy healing due to events on the ranch and the transformation of the ranch from a place of fear and death and predatory ET’s to a place of healing. 5. 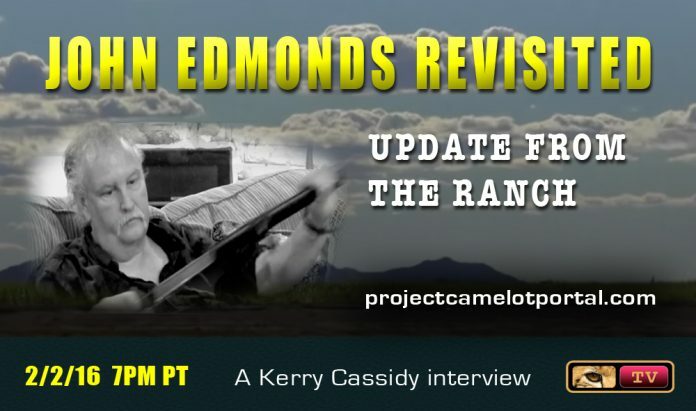 ET’s are ready to help the ranch to make the transformation and they are ready to tell their side of the story and make a public disclosure. 6. ET’s and Star Dust Ranch work together to create a collateral series of demonstration projects to help mankind to achieve answers to problems currently plaguing the world. 7. Regular in person meeting with ET’s to start the collaboration process. New book soon to be released available for presale.